The Nesco MS-2-6 Clean-A-Screen is ideal for drying foods that sticks with easy remove. This screen can be inserted into the trays of Nesco For FD-1010, FD-1018P, FD-1040 food dehydrators to prevent foods from sticking during the drying process. The MS-2-6 Clean-A-Screen has two sides smooth side for comfortable handling and rough side for easy removable of sticky foods. The Clean-A-Screen is perfect for drying small items like sticky fruits, small foods, spices and herbs that would normally fall through the spokes of the tray. 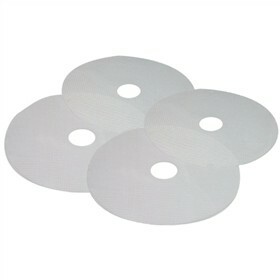 The fine-mesh screens are flexible, So they can be curled and foods simply peeled off. This screen is easy to clean and safe to use in dishwasher. The Nesco MS-2-6 has many exciting features for users of all types. You can extend the lifetime of your Nesco MS-2-6 with the purchase of a FactoryOutletStore Factory Protection Plan. See the Nesco MS-2-6 gallery images above for more product views. The Nesco MS-2-6 is sold as a Brand New Unopened Item.